Young usually are inshore during spring and summer and move offshore to join adults during fall and winter. Large numbers of bluefish migrate to Florida from northern stocks during winter. Bluefish travel in large schools following bait fish. Members of a school tend to be about the same size because they are cannibalistic. Spawning occurs offshore in spring and summer. 31 lb 12 oz By:James M. Hussey on Jan 30 1972 at Hatteras, NC. Jump easily and frequently, long hard runs are also made often. Bluefish may be caught from boat or surf fishing. Chumming is a helpful technique, and a wire leader is a must to prevent fish from biting through the line with its sharp teeth. Anglers use a variety of plugs, sand eel type jigs, and squid- or mackerel-like lures. Pogies, mackerel or eels are good live baits and cut bait works too. Average size is 3-5 pounds. These fish are a bit oily for some people, so gut them and clean them as soon as you legally can. 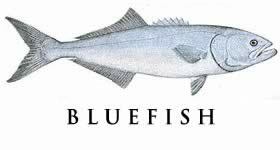 The food value of Blues is in the fair to good range, the smaller fish can be done by broiling or pan frying ~ best to eat this species on the same day is is caught. The larger fish should be bled and then iced promptly, after filleting of the Bluefish, the dark meat should be trimmed out. Be sure to check the state regulations as to when the fish can be filleted legally.